Event of a Lifetime or Backyard BBQ, Party Time Rental, Inc. is committed to your memorable and hassle-free event. For the busy or 'out of town' planner ask about Delivery, Installation & Set-up services. Rental items include canopies, tables, chairs, grills, bounce houses, chocolate fountain, specialty linens, glassware, flatware, dinnerware, buffet/concession equipment, dishes, games, staging/lighting & sound systems along with wedding decor and much more! Party Time Rental staff prides themselves in providing top of the line quality product with great service and attitude that matches! We want to make sure your event is perfect and stress free! Call us or stop in! Referrals are the best way for us to earn business...let us start with you...you will be happy to pass our name to your friends and family for all their events and parties of all occasions! Party Time Rental - Where it's always Party Time! Visit our showroom located on Hwy 371 north of S & W Bait. 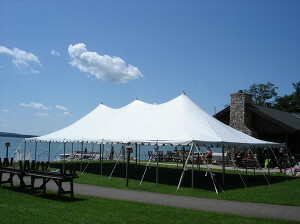 Also visit our Web page for a full list of rental products/pricing and pictures of what we do best! Located 4 miles South of Nisswa on Hwy 371 by S & W Bait Shop.